The answer to how much loan can I get from bank is to multiply your net salary by 60 to reach at the maximum home loan amount that you can get. This is applicable to any public sector bank like SBI, PNB or a private sector bank like ICICI, HDFC. Banks can finance home loan for salaried professional up-to 60 times monthly NET pay and can sometimes vary based on your personal credit history rating. Monthly in-hand (take home or net pay) salary: INR 50k. Looking for a home loan of 30 lakhs. Real Estate property cost: 40 lakh. Gross monthly income might be much more than INR 50,000 per month. Bank only considers your in-hand salary. Calculate your in-hand salary. You don’t have any other loan like car or personal on your name. You do have 1 credit card with credit limit of INR 10k. Bank rule: Eligible to get 60 times your monthly NET pay as loan. All sounds good if you ask “How much can I qualify for“. Bank’s answer is “you are pre-approved for 30 lakhs of loan“. Don’t get excited about ‘how much loan will I get approved for‘ as the answer is a bit tricky. The bank will evaluate your loan eligibility once again once you apply and pay processing fees. This time, the total eligibility will be much less than 60 times net pay. Assuming bank played no tricks and your credit score is ‘Good or excellent‘, it is definitely your salary component that’s reducing your over-all loan pre-approved amount. The components in RED (LTA and Medical) are not considered part of your in-hand income by most banks (like SBI) specifically for housing loan. Which is lower than earlier eligibility by about 10% i.e. 2,85,000. If you had planned your finances keeping in mind that you would get a loan of 30 lakhs by bank and manage other money yourself, you now would need to pool in 2,85,000 more. How much Loan can I get approved for? If you shop around using credit cards, the total of ‘minimum payment‘ each month on all cards is REQUIRED to be deducted from your NET pay to reach the loan eligibility. This is generally 10% of your total credit limit. In our example, this comes out to be INR 1,000 per month.Now, reduce your NET pay (45,250) by another 1k to reach at 44,250. If you have an existing loan, do deduct the monthly EMI amount from your net pay. In our case, we have assumed to have none. 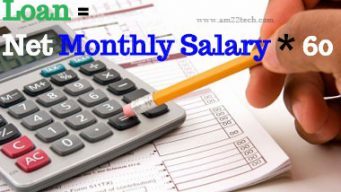 If you do have one, deduct the monthly EMI from the Net Pay calculated in above point. If you are trying to take home loan for an ‘under construction‘ property, the bank will reduce the loan eligibility amount by the rent you pay monthly. We have assumed to be buying ready to move in home and hence no more deductions. At this point, you should have the NET pay (44,250) that bank will consider for finding your maximum loan qualification. To answer your question: ‘How much loan will i get approved for’, simply multiply 44,250 by 60. The loan eligibility calculator is with you, if you have read the above information. Simply multiply the net pay and you reach a maximum amount. I hope you would have understood the concept. I would urge you to keep these calculations in mind and do not blindly believe what bank sales executive commits, as he is more interested in bringing a client to bank. You will get to know these details only when you would have actually paid the non-refundable processing fees of the bank. You would have no option but to go on with it and find out other ways of financing the deficit amount. Comments, suggestions and queries are most welcome. My husband’s gross salary is 50k per month, we wish to buy a house. And we don’t have any other collaterals…..
How much loan we will get???? You can expect to get about 30 Lakhs of Home loan.